Pork Chops with Capers, Thyme for Cooking gourmet recipes. I normally buy bone-in chops, then cut the bone out before cooking. For bone-in plan on 16 - 18oz (500gr). 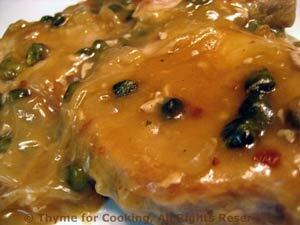 Boneless pork chops, quickly browned then simmered in a white wine caper sauce. Spread flour on a plate. Dip both sides of pork chops in flour, shaking off excess. Heat oil in a nonstick skillet over medium-high heat. Add pork and brown on both sides, about 5 minutes each. Finely chop the garlic. Add garlic and sauté 30 seconds. Add stock, white wine and capers, cover, reduce heat to low and simmer 15 minutes. 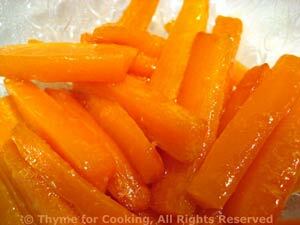 Uncover, increase heat and simmer until sauce has reduced and thickened slightly. This near-perfect food of the Incas has slowly been gaining recognition in the culinary world. It cooks quickly and has a nutty flavor that goes with everything. Here it's paired with the earthy taste of mushrooms and shallots. Finely chop shallots and mushrooms. In a small skillet heat olive oil. Add shallots, mushrooms, and sauté until tender, about 5 minutes. 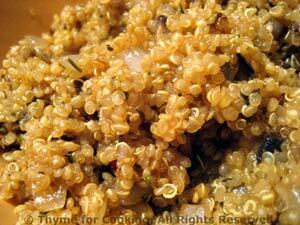 Stir into quinoa when quinoa is cooked.